…in sacrificing fact and truth, Donald Trump is turning personal beliefs to knowledge. This is governance by anecdotes. And this has dire implication for governance, the history and global image of United States and the moral health of the nation and the people. Immediately after his inauguration as the president of the United States of America, Donald Trump plunged himself into an unnecessary controversy with the American people and the media. The source of this is his tendency to pass on his beliefs, and those of the people around him as the truth, and as knowledge. And this has raised, beyond the narrow confines of the academia, the problem of truth and knowledge, and ultimately how they shape citizens’ consciousness and a nation’s history. Creating and continuously stoking this unnecessary controversy, first, Trump believes that his inauguration crowd was the biggest in the history of US presidential inauguration. Americans and historians of the American presidency have proved this to be false. Based on the evidence many agree with (except the Trump administration and core group of race supremacists headed by Steve Bannon who are embedded in the White House), it has been shown that President Obama’s inauguration had 1.8 million people in attendance, while Donald Trump’s had only about 250,000 people. Second, Trump believes that his inauguration crowd was also bigger than the number of women who came together to March on Washington in protest against his inauguration on the second day of his administration. Trump’s claim is false because the Women’s March attracted no less than 500,000 womenfolk in Washington DC, as based on verifiable evidence. Finally, Trump believes he lost the popular vote in the 2016 US presidential election by about 2.8 million votes because between three and five million ineligible voters participated in the election and voted for Hillary Clinton. Trump’s political and moral worldview, which is akin to “I believe therefore I know”, has been proved to be flawed by philosophers – and evidence-based scientists – in and out of the academia. Some hint of ancient history may be helpful in shedding some light to this particular mental trajectory of the new president. Plato it was who proposed the account of knowledge based on justified true belief, and given this account of knowledge, it is possible that Donald Trump is still living in the Platonic era where, philosophically speaking, belief played a role in the definition of knowledge. But Plato’s account of knowledge as justified true belief, has been shown in the light of fact, logic and more sophisticated scientific reasoning to be unstable and cannot account for knowledge because one (under the explanation that justified true belief amounts to knowledge) can actually – as Trump has consistently shown – believe in a claim that is patently false. More importantly, Plato lived around 423 B.C.E and 348 B.C.E. In other words, something must be profoundly wrong when a president of the United States in the 21st century (a country which is a technological and scientific power house) is using an unstable notion of knowledge developed before Christ to explain contemporary issues that affect the lives of people. An account of knowledge based on instinct and belief has dire implication for national and global security and the world at large. What is of serious concern here is that the president of the United States has based his belief on an important matter that may shake the foundations of American democracy on a second or even third hand story, which is clearly a gossip. And in his capacity as the president of the United States, he relayed this same gossip to House leaders of the United States House of Congress. 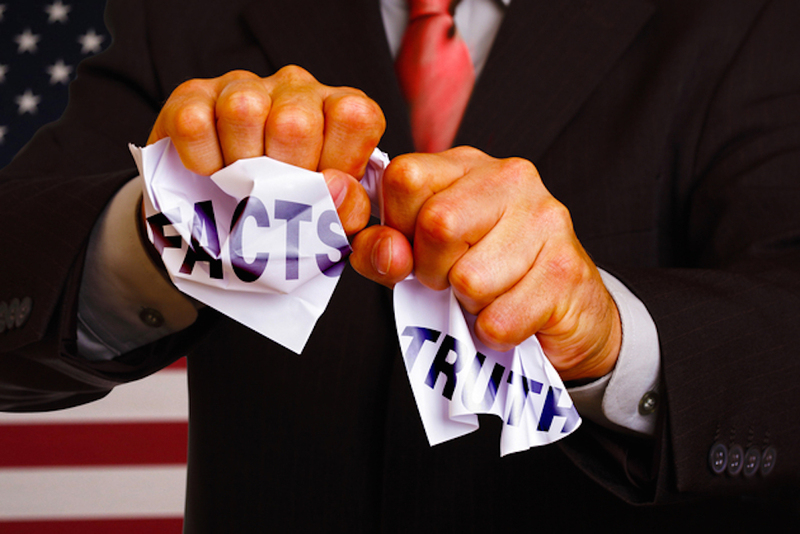 Because this has serious consequences politically, socially and from the standpoint of national and global security, many Americans have protested Trump’s tendency to deny basic facts, while substituting his private and personal beliefs (what his counselor, Kellyanne Conway called “alternative fact”, and is a dubious epistemological notion echoed by his press secretary Sean Spicer) as knowledge. There are many instances in the Trump world that show the implausibility of using personal beliefs as the basis of truth and knowledge, but one instance stands out: Trump’s unsupported claim that there was voter fraud in the 2016 election and that this “fraud” was the reason he lost the citizens’ votes by 2.8 million votes to Mrs. Clinton, though he won the electoral college and became the president. For the records of citizens and scholars, globally, who are studying this aspect of history, while Hillary Clinton polled 65, 844, 954 votes (48.2 percent) Donald Trump recorded 62, 979, 879 votes (46.1 percent). But it is Trump’s reporting of his unsupported claim of an electoral “fraud” that shows a flawed notion of knowledge and truth, belying a mindset that many observers of this aspect of history have found disturbing. Trump told Congressional leaders that his friend claimed that some people who he thought did not look like eligible voters, voted. These people voted in a Florida voting precinct. That testimony to US Congressional leaders is the basis of Donald Trump’s belief that between three and five million ineligible people voted in the election, and for Mrs. Clinton! Trump repeated a version of the same story to Margaret Carlson of Bloomberg in December 2016, long before he was sworn in as president. Then, Trump said the golfer – who he did not name then, but who turned out to be Bernhard Langer – mentioned that the two “ineligible” voters were Guatemalans. Subsequently, it has been reported that these two Guatemalans did not vote. More importantly, the relevant question that shows the need to be very careful and for the world to look closely at the tenuous relationship Trump has with the truth and facts is: Who is this “friend” who told Trump that he saw ineligible voters in a voting precinct in Florida, and who Trump has relied upon as testimony in official conversation with Congressional leaders? The “friend’ is none other than Mr. Bernhard Langer, the 59 year old golfer from Bavaria, Germany – the same country as Trump’s grand father. The first report, which was later changed, was that Mr. Langer wanted to vote but could not vote because of the long queue of those he thought were not eligible to vote. The evidence Langer reportedly had that they were ineligible to vote was their physical looks! This version of the story was later contradicted, which indicates that this event – the basis of Trump’s belief – might not have happened. This is because Langer’s daughter told the New York Times that her father is not a US citizen, meaning that he (Langer) is not entitled to vote. So a person who is not entitled to vote could not have been on the voting queue waiting for his turn to exercise suffrage. With this information, Trump’s testimony fell under serious stress. Langer’s daughter added that her father, though a golfer like Donald Trump, is not Donald Trump’s friend. She did not see a basis why Trump would talk about her father. In all the story, Langer himself did not talk to the press, though he later put out a statement claiming that he never told Trump any such thing. Rather, according to Langer, he heard the story from a friend, and subsequenty re-told it to another friend, who must have shared the story with someone with ties to the White House. This is how Donald Trump appropriated the story and made it the basis of his knowledge claim on the huge number of ineligible voters who cast their false ballots for Hillary Cl inton. What is of serious concern here is that the president of the United States has based his belief on an important matter that may shake the foundations of American democracy on a second or even third hand story, which is clearly a gossip. And in his capacity as the president of the United States, he relayed this same gossip to House leaders of the United States House of Congress. There lies the immediate danger because Donald Trump as the president of the United States has his fingers on the nuclear codes, something that he could trigger on the basis of falsehood, and a mind that substitutes facts, truth and knowledge with falsehoods and personal beliefs. …In calling falsehood, “alternative facts”, it would seem that Donald Trump, and his two counselors – Steve Bannon and Kellyanne Conway, are working straight from Joseph Goebbels’ (Hitler’s chief propagandist) playbook in creating propaganda and manipulating the American people. The danger for society is that the impact of a lie that is repeatedly told can be devastating. In calling falsehood, “alternative facts”, it would seem that Donald Trump, and his two counselors – Steve Bannon and Kellyanne Conway, are working straight from Joseph Goebbels’ (Hitler’s chief propagandist) playbook in creating propaganda and manipulating the American people. The core group of Steve Bannon, Kellyanne Conway and Trump himself already used this Goebbels’ playbook during the campaign and it worked. The core of Goebbels’ playbook is that there is nothing like truth or falsehood, as these are mere words that can be moulded until they clothe ideas and disguise. This is why Joseph Goebbels believed that a lie told once remains a lie, but a lie told a thousand times becomes the truth. And the bigger the lie, the better. But the most devastating aspect of the playbook is what Goebbels saw as the effect of their lies on the German people. These are his words: “Propaganda works best when those who are being manipulated are confident they are acting on their own free will.” In other words, Joseph Goebbels saw his fellow Germans, who were the consumers of his Hitler’s propaganda, as mere tools that must be made to believe through manipulation that they were acting of their own free will in regurgitating the content of the propaganda and believing in it. The effective use of the Goebbelean playbook by Trump’s core group is visible. It explains why, contrary to fact and common sense, 52 percent of Republicans and Trump voters continue to believe in a December 2016 YOU GOV poll that President Obama was not born in the United States of America. Trump made that possible. And today, against facts available to all, and based on the propaganda of Trump’s core group, 34 percent of manipulated Republicans and Trump voters believe – according to a January 2017 Public Policy Poll – that Donald Trump had the biggest crowd of US Presidential inaugurations. In the same poll, 43 percent of Trump and Republican voters believe wrongly that the Trump inauguration audience was bigger than Obama’s inauguration audience, and 59 percent of them believe wrongly that the Trump inauguration crowd was bigger than the Americans who protested against Trump during the Women’s March On Washington! The Trump administration’s idea of “alternative facts” as the bedrock of knowledge and truth is intellectually and morally disturbing because let us suppose members of the new president’s core group were to write a history of this period, what would they write? What will be the facts, knowledge and truth? Will they respect facts as they are without subjecting them to their beliefs? In a serious notion of knowledge, facts and truth matter; facts and truth are prior and they come before one’s belief or opinion. Everyone has a right to their opinion, but no one has a right to “personal facts” for facts are verifiable public entities. To encapsulate lies and falsehood as “alternative facts”, as Trump’s counselor Kellyanne Conway has done and Trump administration is doing, is destructive of our obligation as scholars to learners and our students; it is destructive of facts, knowledge and truth and our moral and epistemological obligation to uphold them. So in sacrificing fact and truth, Donald Trump is turning personal beliefs to knowledge. This is governance by anecdotes. And this has dire implication for governance, the history and global image of United States and the moral health of the nation and the people.